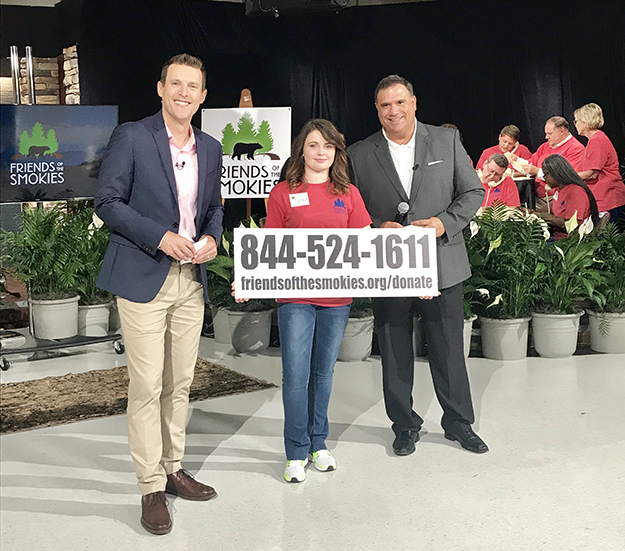 KODAK, TN – Friends of the Smokies collected $210,525 in donations Wednesday during its 24th annual Friends Across the Mountains Telethon from hundreds of callers, online donations, and support from sponsors Dollywood, Mast General Store, Pilot Flying J, and SmartBank. Since 1995, Friends of the Smokies’ telethons have raised more than $3.9 million in support of America’s most-visited national park. The telethon was broadcast live Wednesday night on WBIR in Knoxville, TN, WLOS in Asheville, NC, and on Facebook. Donations made Wednesday night will support the organization’s 25th Anniversary Signature Project to upgrade the park’s emergency radio systems. The $2.5 million effort will leverage $1.25 million in federal funds and grants to match every donation made to Friends of the Smokies. The state-of-the-art radio upgrades will allow rangers to respond more quickly and effectively to emergency situations in the park, keep more than 11 million annual visitors safe, and communicate with emergency services in surrounding communities. In addition to this capital campaign project, Friends of the Smokies will provide more than $1.2 million in annual support to the national park. During Wednesday’s program, SmartBank presented a check for $15,000 and Sugarland Cellars presented a $16,000 check to support the fundraising efforts. Justice Gary Wade, Friends of the Smokies’ founding board chair and dean of Lincoln Memorial University’s Duncan School of Law, pledged $5,000 on behalf of the school during the broadcast. Matching telethon donations can still be made online at FriendsOfTheSmokies.org/donate or by calling the TN office of Friends of the Smokies at 800-845-5665 or the NC office at 828-452- 0720.